If you want more detail, you can read the full ProtectiveClean 5100 review further down the page or watch my video review. 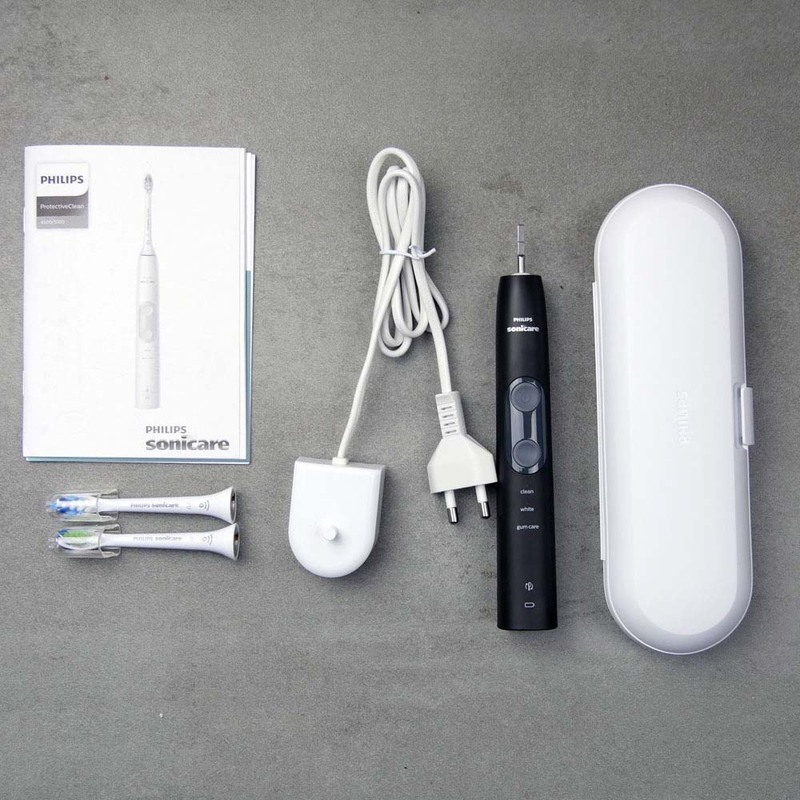 The 5100 is a solid mid-range electric toothbrush with nothing drastically wrong with it. Made by one of the most premium brands within the space, it is a well built strong performing brush, that offers a little bit extra both in performance and box contents. Sonicare’s very own ProtectiveClean 4300 would be our choice over the 5100. It offers a little less and is a little cheaper, but it has most of what you need. Alternatively Oral-B’s Smart 5 5000 is another consideration alongside the ProtectiveClean 5100. Whilst the 5000 misses out on BrushSync, it delivers its own advantage with Bluetooth connectivity and a brush head storage compartment. 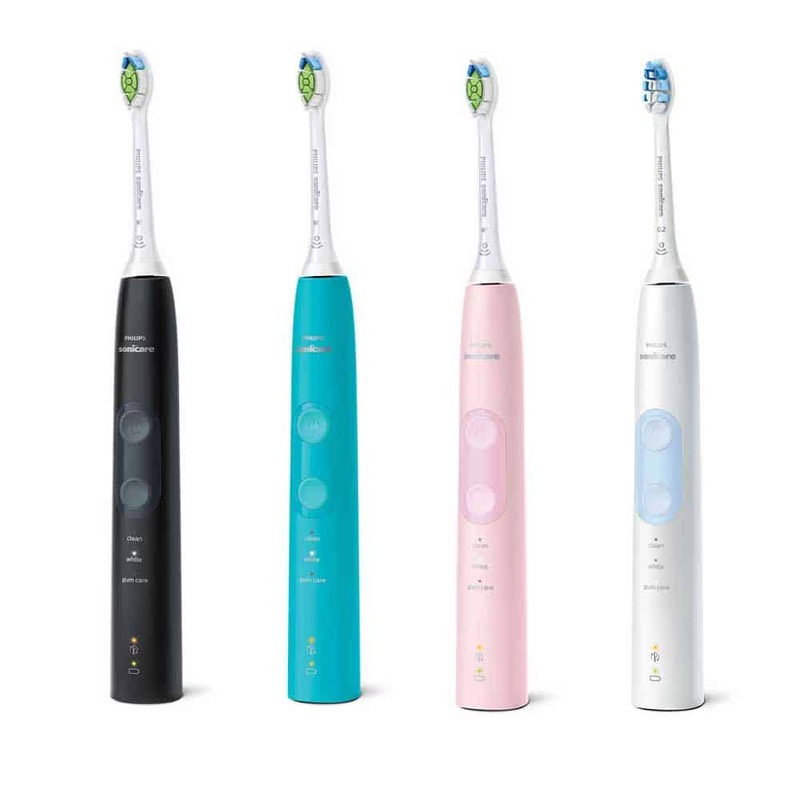 You may also like to check out our best toothbrush 2019 article, where we offer clear buying choices based on category. 3. Where is the best place to buy the Sonicare ProtectiveClean 5100? At launch of the new ProtectiveClean series, the 5100 sits firmly in the middle of the range, offering a bit more than the 4300 below it and a little less than the more fully featured 6100. Inspiration has clearly been taken from the flagship DiamondClean Smart, but features and box contents have been altered to bring the 5100 in at a more affordable price point. 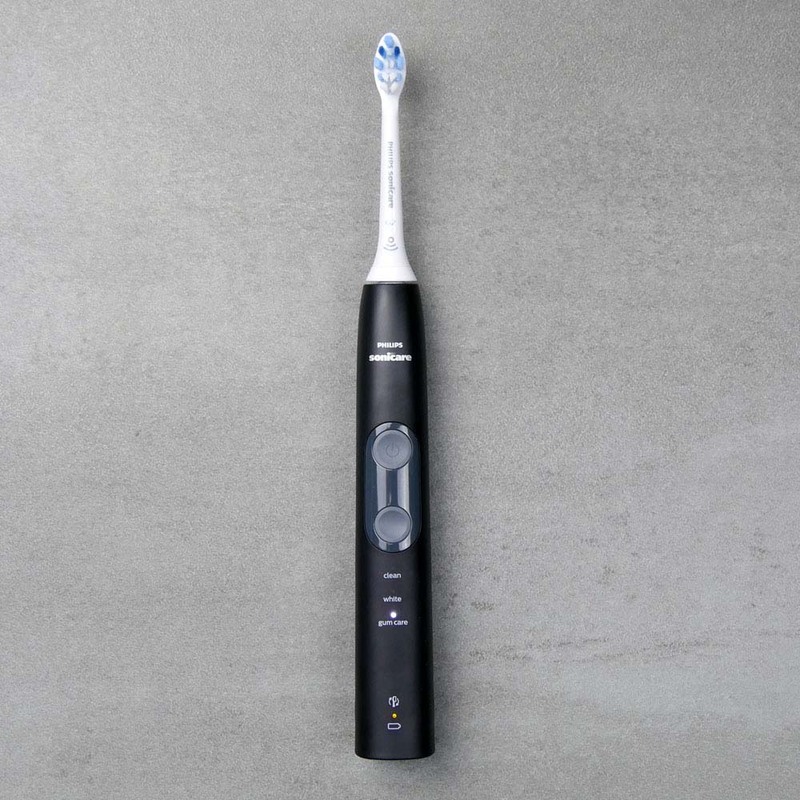 It’s claim to fame and one of the driving forces behind the need for such a brush is the new BrushSync technology, a very smart advance in making use of tech to work for you and I as electric toothbrush users. But is this the brush for you? Read on to find out. As of summer 2018 when this review is written, 4 different variants of the ProtectiveClean 5100 exist. All share the same features and technical capabilities and for the most part, the same box contents. There is 1 exception, model HX6859/17 that comes with only 1 brush head in the box compared to the 2, with all the others. Listed below are the models available at this time, their official part code and details of which brush heads come supplied in the box. Availability will differ. Particularly popular colours like White and Black will likely be easier to source. The Turquoise and Pastel Pink can be purchased, just perhaps not from your preferred retailer. To find out who stocks which model, head to the Sonicare website where this sellers for each option will be listed. In this hands on review, we are using the Black Gry 5100 series, HX6850/10. What are the things to like and dislike about the 5100? Design – Smart and comfortable to hold in hand, the handle comes in a number of different colour options. 3 cleaning modes – A choice of cleaning modes to achieve the cleaning results you want and are clearly labelled on the brush handle. Price – Potentially a little over priced when you consider the alternative choices available today. 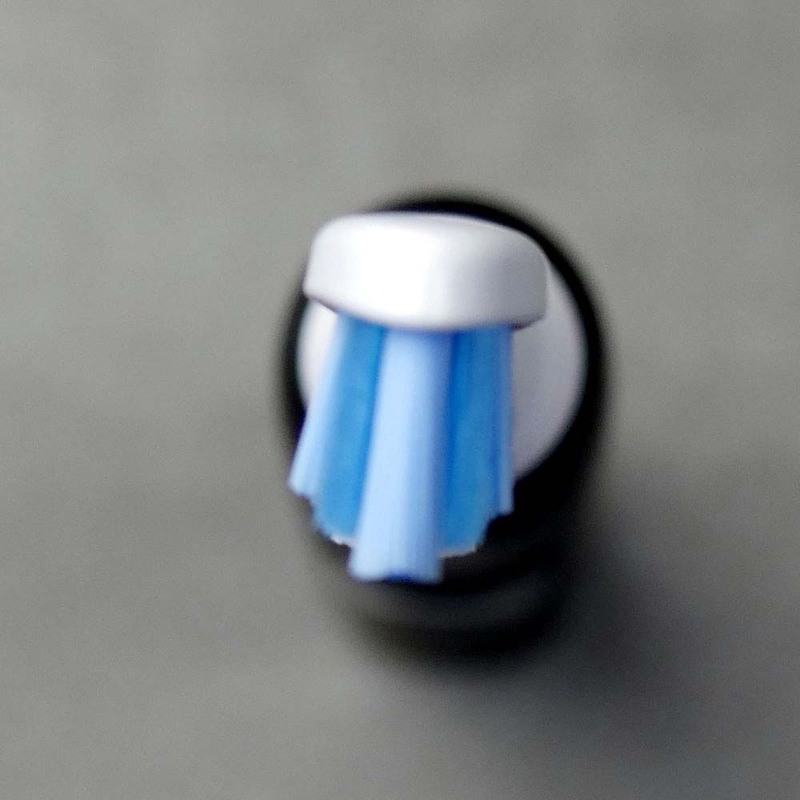 An upgrade on the Sonicare ProtectiveClean 4300, the key attraction to this brush has to be the extra cleaning modes that are available, but what is the brush really like in the hand and to use? Let me explain in great detail. Out of the box and in the hand, the ProtectiveClean 5100 feels great. Quality is certainly a word that comes to mind. Rounded in its design, there are no harsh edges and the lack of rubber grips and plastic ridges on the handle make it comfortable in hand and smooth to the touch. The plastic handle has been finished in a matt colour scheme, it is not glossy like many models of years past. At launch, 4 different colour options are available. I really like the options you have and it certainly helps the brush appeal to a wider audience. It is the Black Grey that I have in hand here. None have colour matched accessories or brush heads. Far from critical in the scheme of things, Sonicare have previously done this so it would have been nice if there was a bit more consistency. The provided travel case, charging stand and brush heads are all White. Taking a look at the brush handle side on, with the brush head fitted, you will see that the head sits at a slight angle. 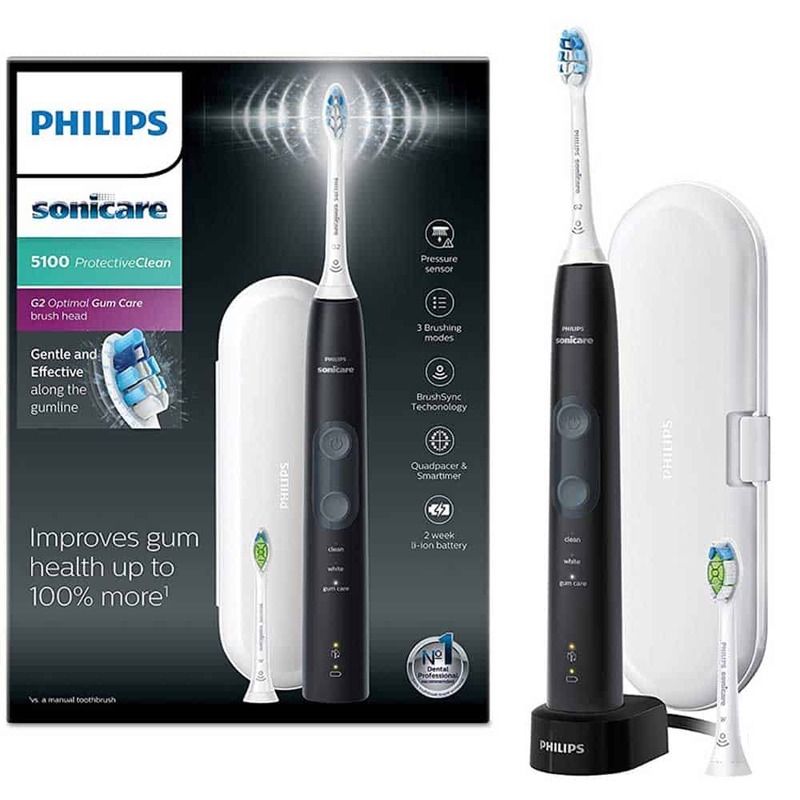 Back to the front of the brush handle and you will find towards the top, the Philips Sonicare logo. Surrounding these buttons is a plastic panel that gives a colour accent to the brush handle. It is colour matched to the brush handle with the accent coming from the fact that the panel is finished with a glossy coating, contrasting the matt finish of the brush handle. The exception here is the White and Light Blue colour variant. This glossy panel is the Light Blue colour, whilst the rest of the handle is White. Placed below these 2 buttons are LEDs and names of the cleaning modes. Unless you have used or analysed other models that do not have such LEDs, do you realise how useful they are. Whilst the Oral-B Smart 4 or 5 are clear competition for the 5100, neither have any on handle icons or ways of telling, which of the multiple cleaning modes are actually active. At least these LEDs make it super simple. Normally when I spin the brush handle round to take a look at the back, I am presented with a series of plastic ridges, raised rubber dots or a large piece of rubber that the fingers naturally grip too. This is not the case here. Some might see this as an oversight, particularly if being used by young children or those who struggle to grip onto things. However, in use, even when wet, the brush certainly didn’t feel all that slippy in hand. I didn’t feel like it would be all that easy to drop. Smooth to the touch, the back of the handle is an expanse of colour. Breaking the flow slightly is a little protrusion at the bottom of the handle. At the top of the brush handle is the metal shaft that the brush head connect to. 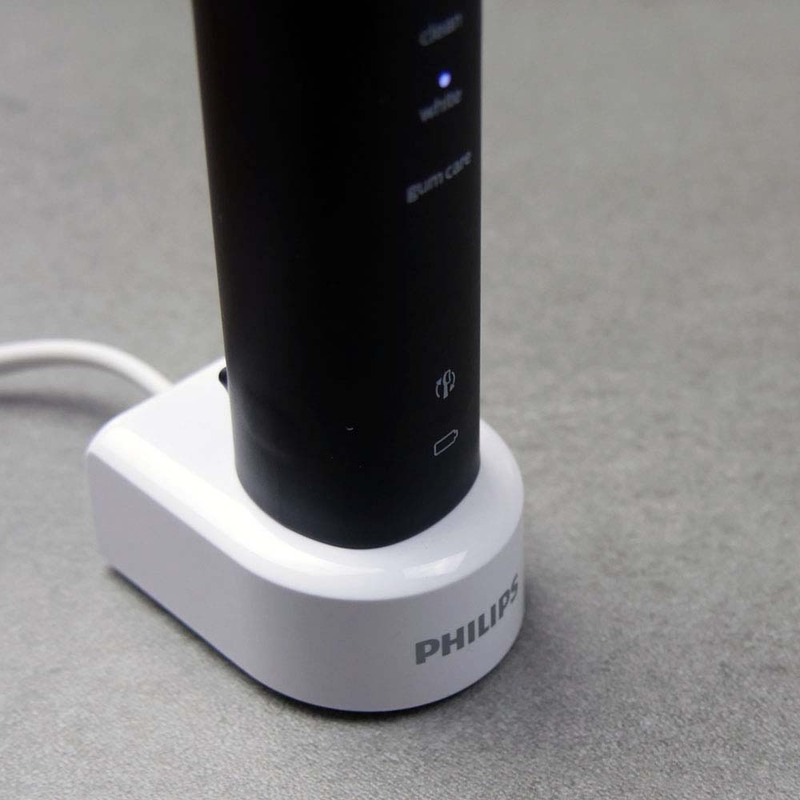 This metal shaft feeds into the motor sealed inside the handle along with the rechargeable Lithium-Ion battery. 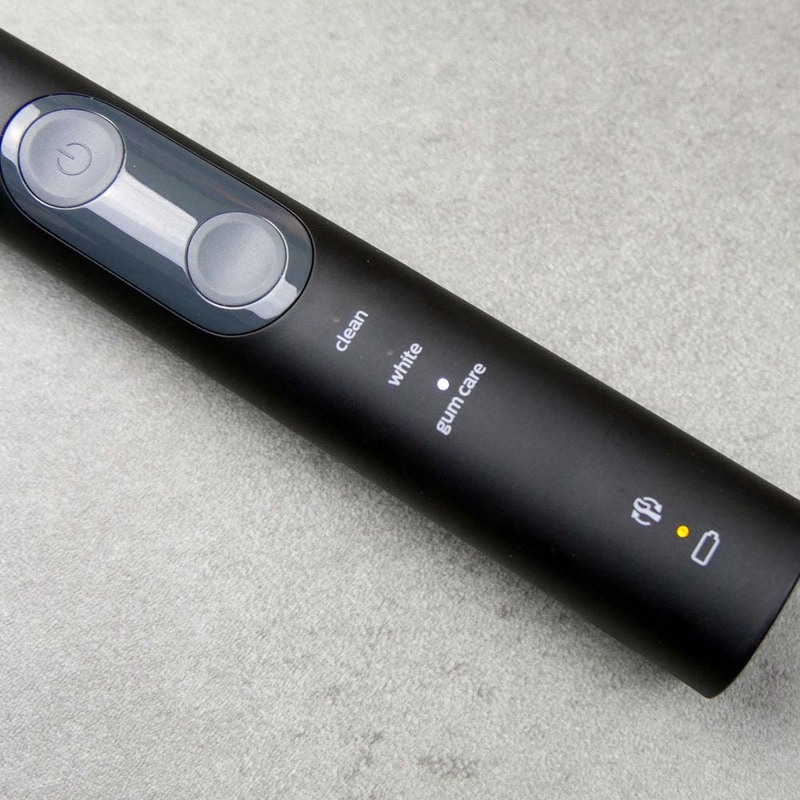 The brush offers a minimum of 2 weeks usage between charges. More information is available in the ‘Battery Life’ section of this review. Brush heads simply push on and pull off, they are really easy to fit and change. Sonicare ideally want you to change the brush heads and use the most appropriate head for the cleaning mode that you wish to use. Most variants come with 1 x G2 Optimal Gum Health and 1 x W2 Optimal White brush head. These are just 2 styles from a much broader range available from Sonicare. Our ultimate guide to Sonicare brush heads goes into a lot more depth to explain the differences and how they work. The primary difference is the way the bristles are positioned, their firmness and the shape they are cut to. One style might focus on polishing the teeth, whilst another focuses on better interdental cleaning. All will provide a good overall clean, but you might wish to find one most suitable for you and your oral healthcare goals. Another very important differentiator, particularly with the Sonicare 5100 is those heads that are BrushSync compatible. You see, inside the brush heads supplied is a small RFID microchip. When the brush head is fitted to the brush handle, the chip is detected and the electronics inside the handle will now keep track of it. You should get the Amber warning light flash 3 times when the head is fitted. The handle knows that the brush head should be replaced every 3 months, so once the handle detects that the brush head has been used for this amount of time, the ‘BrushSync’ LED on the brush handle will light up an Amber/Orange colour. It is at this point you should fit a new head. This technology was first seen on the DiamondClean Smart introduced in 2017. As good as the tech is, there is what you might consider an old fashioned way of checking the wear on a brush head. Each head has fading indicator bristles. As the heads are used, the Blue bristles fade to a very pale almost White/Translucent colour. When they are this colour, it is time to change the head. The RFID chip found in the BrushSync compatible brush heads works only with BrushSync compatible handles like the ProtectiveClean 4300, 5100 and 6100 as well as the DiamondClean Smart. You can use these heads on other brush handles, but the reminder system will not function. 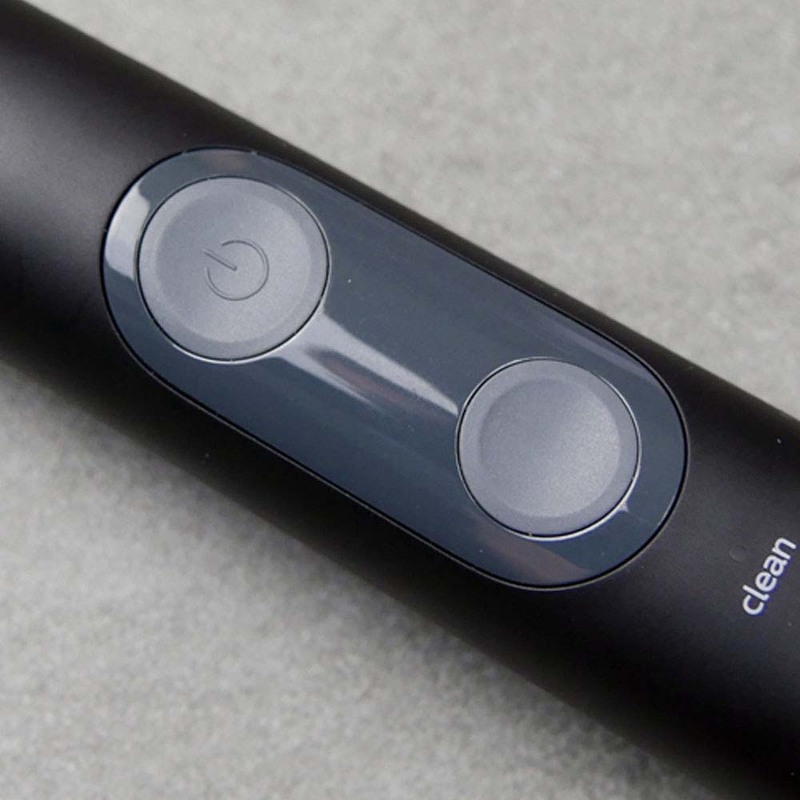 The brush will turn itself off at the end of these cleaning modes too. 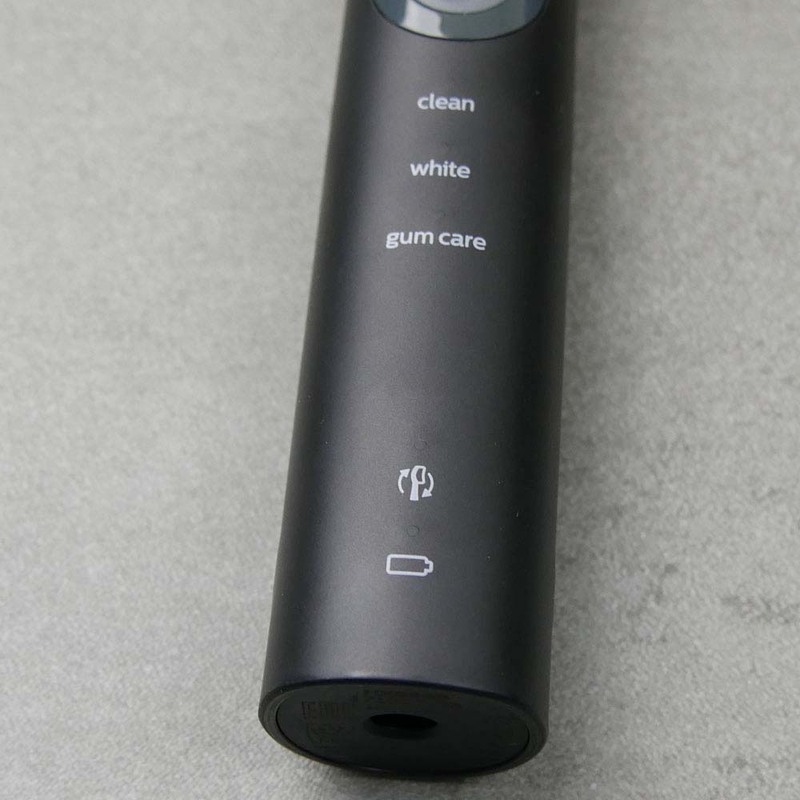 If you use the White or Gum Care mode, the pacer still function for the first 2 minutes of cleaning only. The remaining 30 seconds for White and 1 minute for Gum Care are for focusing on the front teeth and gums respectively. Why not check out our guide to cleaning your teeth to learn, complete with video, how you should brush with an electric toothbrush. Personally I prefer the smaller, round brush heads that Oral-B offer compared to the larger more rectangular/ovalish heads of Sonicare. A 2-minute mode. It gives you a thorough and complete clean. A 2-minute 30-seconds mode. 2 minutes for normal cleaning and 30 seconds to polish the front teeth. A 3-minute mode. 2 minutes of normal cleaning and 1 minute to clean and stimulate the gums. The motor in the brush handle offers up to 31,000 movements per minute. If you like the idea of changing the brushing intensity, the ProtectiveClean 6100 might be worth consideration. You can change between 3 intensity levels on all cleaning modes. As you brush your teeth the bristles need only skim the surface of the teeth to dislodge bacteria, plaque and food debris, lots of force is not required to brush the teeth clean. The handle vibrates to alert you when too much pressure is being applied. In addition, the brushing sensation and sound changes and the BrushSync replacement reminder LED flashes Amber. Whilst the brushing sensation and vibration can be felt, the position of the LED is not easy to see. Much better would be the large visible pressure sensors that emit more light. Sonicare’s own DiamondClean Smart, along with the Oral-B Pro and Smart Series are great examples of this. Reduce the pressure applied to stop the sensor from being activated. It does not take long to get used to how much pressure is appropriate. Seasoned electric toothbrush users may know how much pressure is appropriate. I believe it is more useful to first time or new users. 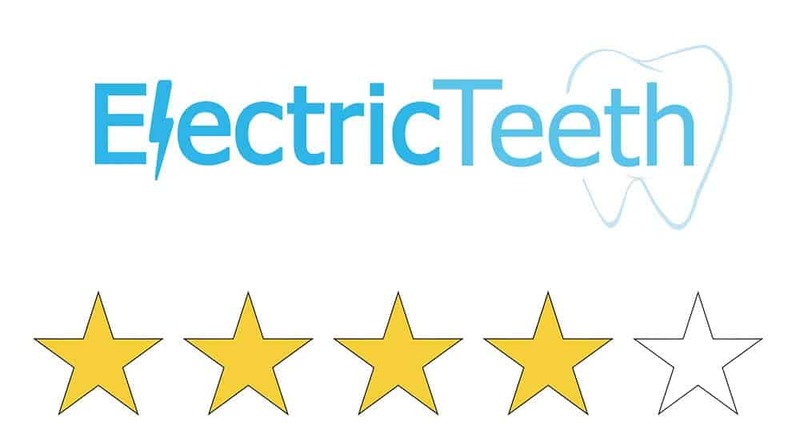 Another great feature for new electric toothbrush users is EasyStart. 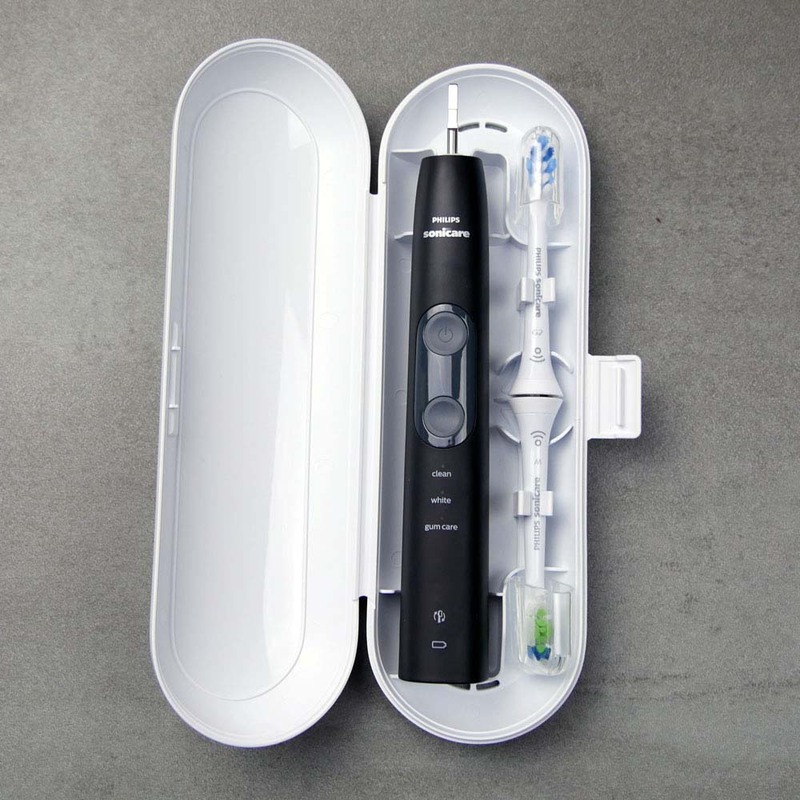 A simple, but innovative touch that shows an extra level of attention and care for first time electric toothbrush users. The full 31,000 movements per minute can seem quite intense on first use. EasyStart eases you in and makes the transition from manual to electric brushing easier. If you want to go straight in with full power you can turn the EasyStart off. How you do this is explained in the FAQ’s at the end of this review. The provided travel case is made from a fairly robust plastic. Hinged on the left side, on the right is a clip to fasten the 2 halves of the case shut. Whilst it does not affect day to day use, you might be keen to hear about Sonicare’s packaging. It feels more environmentally friendly than brushes of the past and certainly trumps the likes of Colgate an Oral-B. The cardboard box and inner tray are smaller than previous brushes and although there is plastic bags inside, they are labelled as recyclable. It is much better than the plastic and polystyrene of the competition. On the subject of competition, I do think you should consider the Smart 4 4000 and Smart 5 5000 from Oral-B. 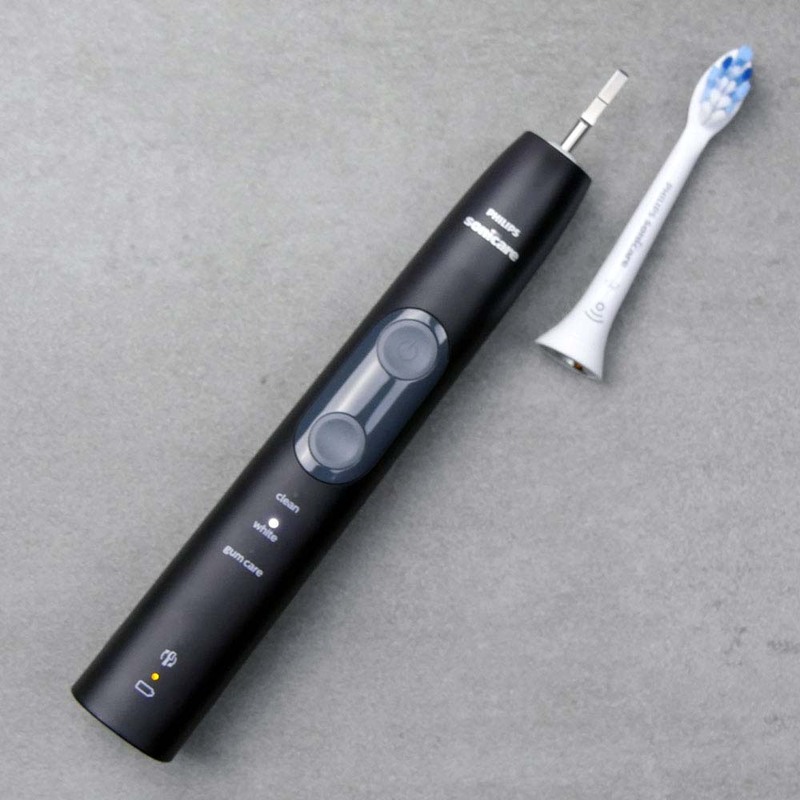 Whilst neither offer the BrushSync technology or have quite the design refinement, they do offer other features including Bluetooth connectivity, large visible pressure sensors and brush head storage compartments. 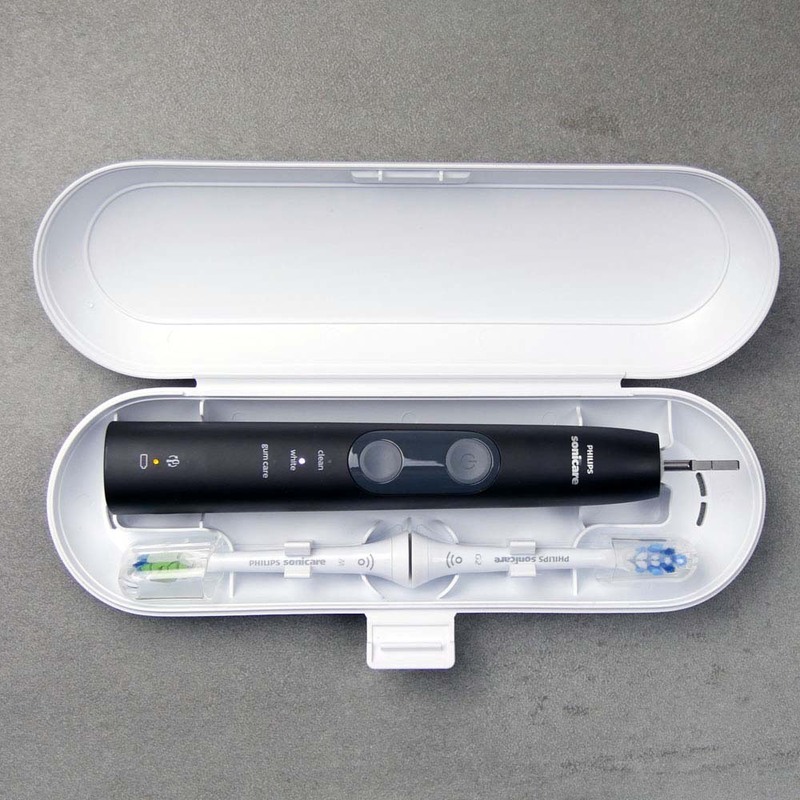 All told though the 5100 is a solid performing electric toothbrush that cleans as well as it looks and feels in the hand. The battery life available from the ProtectiveClean 5100 is more than adequate in my opinion and exceeded expectations. Sonicare suggest you will get 2 weeks of usage from the built in Lithium-Ion battery. Even on the most power hungry cleaning mode, Gum Care, I achieved just shy of 3 weeks usage time, 20 days to be precise. That is 6 more than Sonicare suggest. Therefore 2 weeks is an absolute minimum and really doesn’t sell the 4500 as it should. If you only use the ‘Clean’ mode that runs for 2 minutes you will get even longer. I used the brush exclusively on this mode and achieved a staggering 5 weeks from the battery. 75 cleaning sessions of 2 minutes each. How can anyone not be impressed with that?! The stand is White in colour and not colour matched to the brush handle. Supporting 100-240v that nice thing is, that should you have to take this with you travelling, aside from a plug adapter, you will not need a voltage adapter. A small touch you won’t get with an Oral-B brush handle. Wired into the charging stand is a 2 pin power adapter suitable for UK bathrooms. If you do not have a 2 pin socket in your bathroom, you can buy 2 pin to 3 pin adapters that will allow you to connect and charge the brush from a normal UK mains socket. Money and what something is worth is personal opinion. I might think something is worth X, whilst you think it is worth Y. Neither is right or wrong, it is about what is right for you based on your needs, wants and financial position. I want to present clear information about the pricing of the Sonicare 5100, but I do wish to stress that price is always subject to change. What is current one day may not be the next. A good deal one day might be a bad deal another. Ultimately take on board the following information and make your own judgement on what the 5100 is worth to you. As I write this review, the full suggested retail price of the 5100 is a rather impressive £279.99. I think most reading this will agree, just shy of £300 is pretty expensive for a toothbrush and I am 100% with you on this. But here is where things begin to make a little more sense, of sorts. These significant discounts make the products look more appealing to you and I as consumers. Having spent several years examining the prices, you can’t really compare based on suggested selling prices, instead you need to look at actual average selling prices. The same can be said for the Smart 4 4000. With a retail price of £130, the average online sale price on Amazon is a little over £60. But the reality of the situation is, the 5100 is not worth the £279.99 being asked of it. I therefore have to take the bold decision and base my opinion on the most likely selling price of some 50-60% less than suggested. This means that the likely average selling price will be £110-140. I think all can agree that is a lot less and a lot more reasonable. If I were to be a little picky, judging the brush on features and capabilities alone, this still feels a touch too high. £30 is still a reasonable amount of money to save. I like Oral-B products. In fact I use and Oral-B brush on daily basis. However, there is a certain quality and confidence that comes with using this brush and that can really only be understood when you use it. It sounds odd I know, but trust me, there is just something that makes splashing out a bit more seem fine. Sadly I am not sure that this ‘extra’ I am prepared to spend would stretch as far as £30-60 more than a similarly featured brush. £10-20 yes. I think £90-100 is the price that the 5100 should really be sold at. If you can buy it for this price, you are getting yourself a very good brush. I dare not stop you spending more, but I want you to be aware alternatives exist for less and you might not be getting the best return for your hard earned money. To try and draw further comparison, here at Electric Teeth we make an approximate calculation of what it would cost you to own the brush over 3 years. Aside from the initial outlay of the brush, you have the cost of brush heads. 2 are provided in the box, so you will need another 10 heads over this time period, as they should be replaced every 3 months. Now, the ProtectiveClean 5100 will remind you when those heads need changing, but when they do, they are going to cost you abou £7 per head. Therefore based on 1 user over 3 years, the cost of owning the ProtectiveClean 5100 will likely cost £180 (£110 for the brush handle + £70 for replacement brush heads) or 16p per day. At the full retail price of £279.99 that price would shoot up to £350 or 32p per day. As established previously the ProtectiveClean is a little pricey, with the Oral-B Smart 4 4000 coming in at 8p per day and the Smart 5, 11p. Far be it for me to suggest, but the Smart 4 4000 is an excellent brush and is worth consideration, especially when you can get 2 for the same money as the 5100! Sharing the brush handle, but switching heads with other users in your household will only help bring the cost down and drive more value from it if the 5100 is your preferred choice. When testing electric toothbrushes like the Sonicare ProtectiveClean 5100, we are not putting it through stress tests using specialist machines or trying to actually break it. We used them like you would in your life and add in our experience of handling similar products to draw the conclusions that we do. The fit, finish and quality of this brush is high and to be expected from this leading global brand. Nothing jumps out at me to cause concern. No big gaps, no sharp edges, no loose fittings. Being the electronic product that it is, used in damp environments, it may go wrong, but the chances are slim. If they do, you have the peace of mind it is backed by a 2 year warranty. 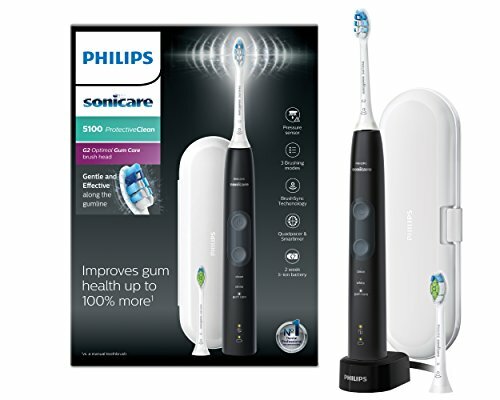 If you want the ‘best value’ electric toothbrush going without lots of extra features this is not the one for you. But, if you want something a little more capable, with a few more nice to haves then the 5100 is worth serious consideration. Multiple cleaning modes make it suitable for those who want to make use of different speeds and power from the brush motor to clean and whiten the teeth, whilst encouraging better gum health. A solid performing brush, there is little to dislike here aside from the price. For many, Sonicare’s ProtectiveClean 4300 will be a better buy, but it does away with a couple of features the 5100 offers. 1 x G2 Optimal Gum Health & 1 x W2 Optimal White brush head is supplied with the brush, with the exception of 1 variant, the White & Light Blue colour choice, model number HX6859/17. This comes with just 1 x G2 Optimal Gum Health brush head. Sonicare claim a 2 week (14 day) battery life, but hands on testing found this would be an absolute worst case scenario. Achieved 20 days on the GUm care mode and 37 with the Clean mode. Yes. A travel case is included in the box.